"THE VULNERABILITY SERIES EXTENDED" IN HAMBURG, GERMANY. 30TH OF JUNE. 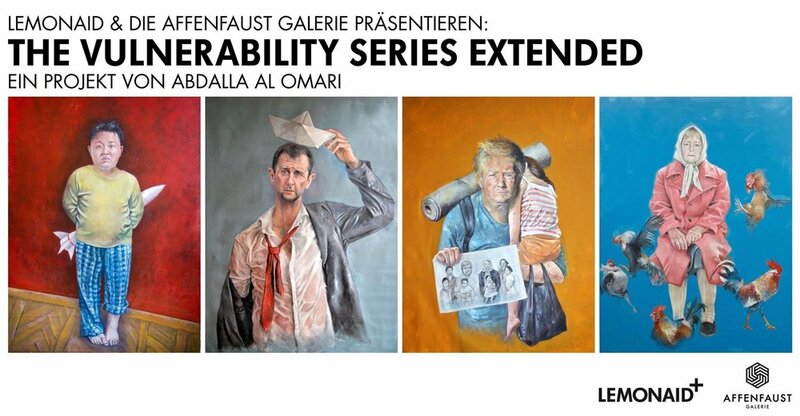 Together with Lemonaid and Affenfaust Galerie of Hamburg, Germany Abdalla Al Omari – "The Vulnerability Series Extended" Show will open Friday June 30 at Affenfaust Galerie with some new works and sketches, one week prior to G20 summit in the Hamburg. Hello. Lets say it clear, I'm weak. And you, officially the strongest, are not that strong either. So, lets all celebrate this. The project "Vulnerability Series" consists of Large volume oil/mixed media on canvas in addition to a short film. "Intimate hours I spent with them have thought me more than I could imagine. Just as easily as everything worth defending can become defenceless, moments of absolute powerlessness can give you superpowers. Even I felt sorry for (my version of) Assad. In this universe without gravity, all we can hold on to is our vulnerability. This invisible wind makes our chest heavy, yet, mysteriously propels us back on our feet again. I have convinced myself it is the strongest weapon humankind possesses, way more powerful than the trail of power games, bomb craters and bullet holes in our collective memories. Vulnerability is a gift we should all celebrate." More Images and updates to be published soon. Stay tuned. 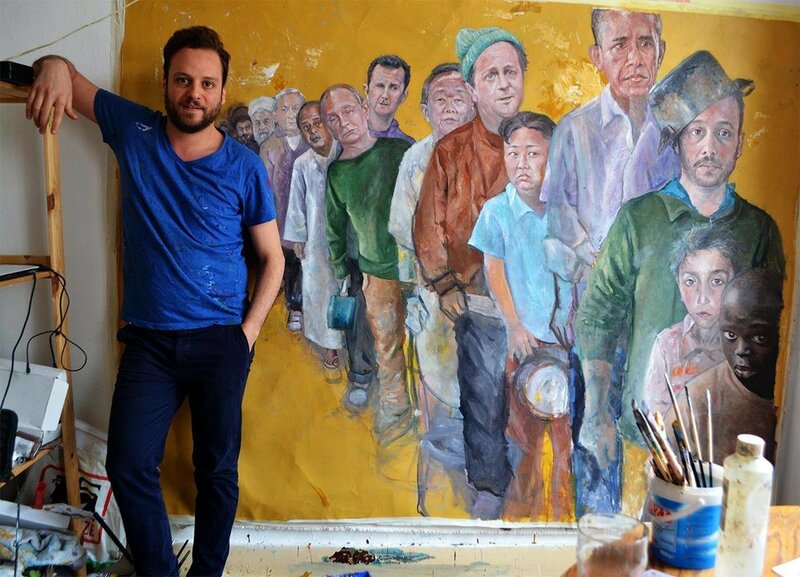 Art patron and founder of Barjeel Art Foundation, Sultan Sooud Al-Qassemi, talking about the first painting of "the Vulnerability series","Barack"(min:06:37), among other incredible works of art currently shown At London's Whitechapel gallery. Interview with Sultan Sooud Al Qassemi on Barjeel Art Foundation's year-long exhibition at London's Whitechapel Gallery with BBC's Yalda Hakim.